As any long time user of both the Twitter platform and Android devices will likely know, the experience can differ somewhat depending on the exact device and, more importantly, operating system that you are using. Among Android users the adoption rate for new OS and updates is reportedly rather slow, with as little as 6% of users having installed the latest Oreo update at the time of writing. This makes it difficult where emoji are concerned as each iteration carries with it its own emoji keyboard, leading to situations whereby users see nothing but crossed out black boxes in place of emoji when scrolling through them Twitter app. This may seem like a minor issue on the surface, but given how widely used emoji have become on Twitter and other platforms it can provide to be a real headache for users. Well it seems that Twitter themselves have now decided to take action against this disjointed user experience by implementing their own emoji keyboard for Android devices, known as ‘Twemoji’. These will be shown to users of the app in place of the native emoji provided by the likes of Google and Samsung, although there is an option to turn the feature off if desired. 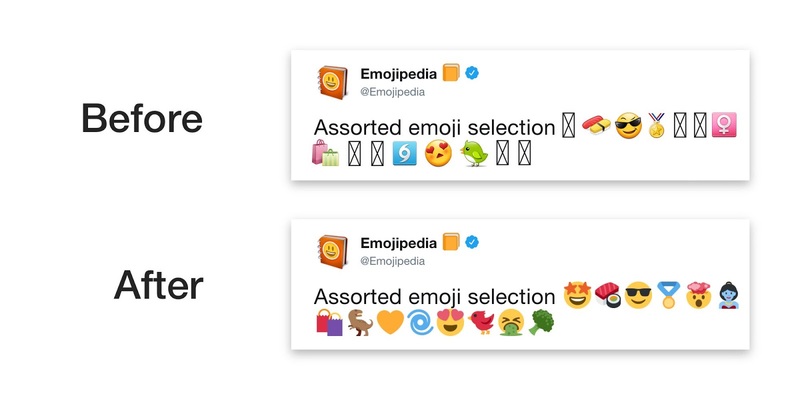 The new Twemoji library, first reported on by Emojipedia, was created using Google’s own EmojiCompat support library – a tool launched by Google in 2017 to allow app developers and companies to upload their own emoji which are supported across all platforms, rather than relying on the fast-changing selection provided by the Android OS.